In the previous post, the depiction of a 2-D ancestry “fan” plus “aprons” allowed us to represent within group variation as well as branching. Whereas in a branching diagram we sought to minimize the crossing over of branches because “they suggest that the two branches at a fork are further away from each other than to one of the earlier branches, which goes against the information contained in the sequence of branches” (see earlier post), with the inclusion of aprons that overlap we can embrace branches that cross over. Consider the following simulation, which also allows for evolution along branches to happen at different rates. In a branching process, each group breaks into two. Imagine that the new groups are small so that by genetic drift, that is, by chance, all members end up with the same variant a some genetic locus (position on the genome), that is, this locus does not contribute genetic variation. (See an analogy given in the wikipedia entry on genetic drift.) The population eventually grows larger and genetic drift ceases to be significant. Each of the new groups then represents a subset of the variation existing in their common ancestor group. If we discount new mutations for now, none of the branched-off groups can have more genetic variation than groups from which they are descended. 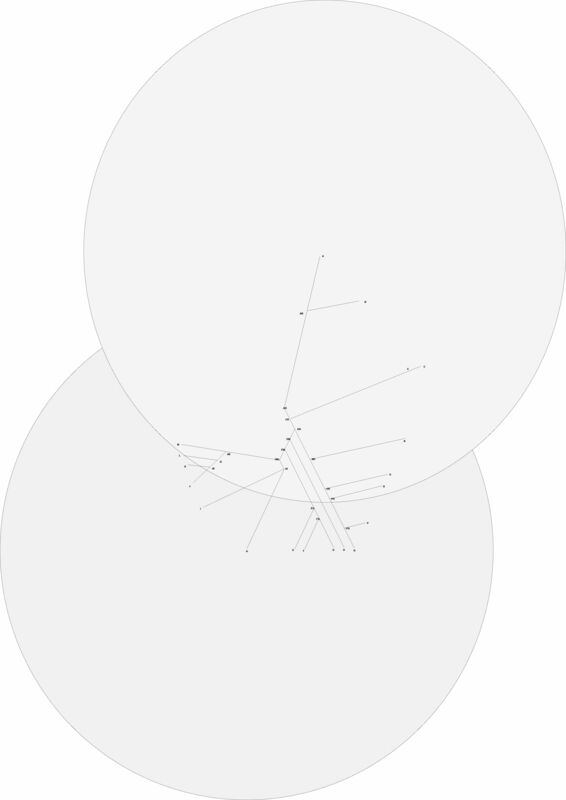 The following diagram uses a random simulation to generate directions of branching and the distances of each branch from its most recent common ancestor. The two dimensions stand for the genetic variation of the whole set of populations. No aprons are drawn around the midpoints of the groups, but it should be noted that the variation of the original population spans a space five times as wide as the area shown in the diagram. The following slide show builds up the messy web branching from one group (AR) to two (AB and NR), and so on, step by step. Of course, this is only a simulation. The actual genetic data might yield a 2-D web that is quite different. Nevertheless, in the next post, we add aprons to the simulation to complete a picture of similarity, diversity, and ancestry. This entry was posted in biomedicine and tagged ancestry, genetics, variation on March 30, 2011 by Peter J. Taylor. 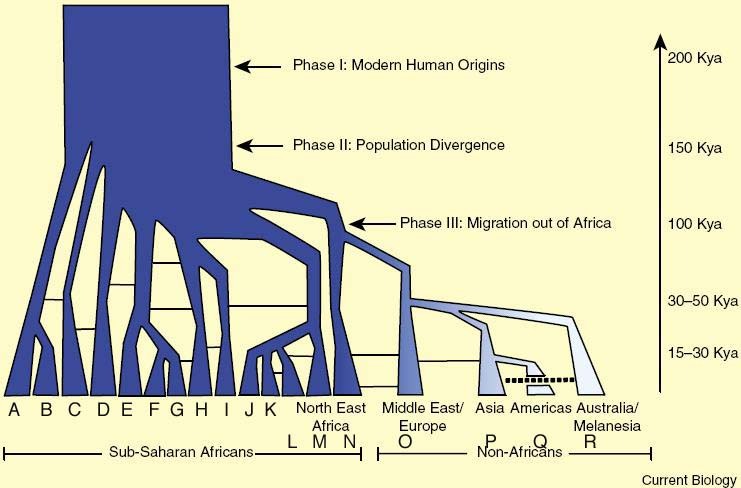 The 2-D depiction in the previous post greatly improved (when compared with the original Tishkoff tree of human ancestry) the degree to which the distance between groups was proportional to the time since the groups shared a common ancestor. (As already noted, we could adjust the depiction if we had a more refined analysis giving us data on different speeds of divergence from the common ancestor down different branches.) The 2-D depiction cannot, however, eliminate spurious appearances of similarity. Even if we put that objection aside for a moment, we need to note that the 2-D depiction still omits the genetic variation around the mid-point of any branch. 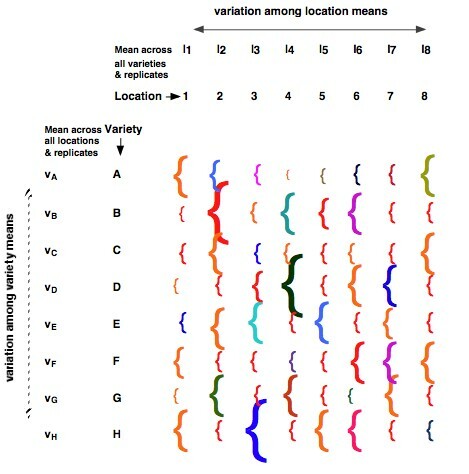 Although variation around the group’s midpoint is suggested by the preceding two features, the Tishkoff ancestry diagram does not in any way convey the fact that, on average, for any genetic locus roughly 85 % of the variation is within a population, 7 % is within a region, and only 6 % occurs among regions (using oft-cited figures from Lewontin 1973, subject to later refinement, but not, to my knowledge, qualitative revision). To convey this, we can add “aprons” around the mid-points of the 2-D depiction. In the following diagram aprons are added around groups A and H only. The aprons are the same size because I can make the key point without exploring the available data to calibrate the apron size to match the different degrees of genetic variation within the groups ate the ends of the branches. That point is that ancestry trees show the genetic mid-points of branches and thus mostly hide the large amount of genetic variation not captured by the branching pattern. Such variation makes it difficult, on the basis of a random selection of genetic loci, to assign an individual to one branch or the other. Difficult but not impossible; merely subject to more errors than to correct assignments. Random selection because clearly there must be some genetic differences that are specific to a branch in order for us to be able to trace ancestry patterns at all. If there are mutations that are very common in some people and rare in others, a tree can be made that captures the most likely branching pattern (i.e., one that assumes the least reversions, i.e, mutation in one direction, mutation back again to the original condition) even if most genes vary in ways that bear no sign of that branching. Now, the 2-D fan diagram is far from perfect and I used a back of the envelope way of determining the size of the aprons, but the combination of the 2-D fan and aprons holds some promise for allowing simultaneously for similarity, diversity, and ancestry—the original question motivating this series of posts. The next posts explore 2-D depictions further. Lewontin, R. D. (1973). “The apportionment of human diversity.” Evolutionary Biology 6: 381-397. This entry was posted in biomedicine and tagged ancestry, diagram, genetics, variation on March 29, 2011 by Peter J. Taylor. “Troubled by Heterogeneity? Opportunities for Fresh Views on Long-standing and Recent Issues in Biology and Biomedicine,” was a talk I gave on 13 Oct. ’10 (abstract). I sketched a number of cases to get the audience thinking about my underlying contention that research and application of knowledge resulting from research are untroubled by heterogeneity to the extent that populations are well controlled. Such control can only be established and maintained with considerable effort or social infrastructure, which invites attention to possibilities for participation instead of control of human subjects. The pdf of the slides and the audio recording are downloadable. (By noticing when my voice rises in volume, which is when I approach the laptop, you can guess when I am clicking from one slide to the next.) Some of the sketches of cases have been addressed in previous posts (see links on the abstract). This blog post consists of some afterthoughts, including questions needing more thought, in response to discussion after the talk. 1. What am I saying researchers should do? The contention underlying the talk (above) is at first descriptive. But it does assume that heterogeneity (of various types) is ubiquitous and is often not paid attention to. The title suggests that researchers could be troubled by heterogeneity. But what should they do? Given that my framework incorporates a social level of explanation, what should they change first—their thinking and methods, or the social situations that enable the knowledge they arrive at to become significant (including, to be implemented in policy and associated practice)? What would be their motivation for changing?—To get a better view of the world (one that applies in a wider range of circumstances)? Or because there is a cost in controlling populations (maintaining infrastructure, etc.)? Or because that control breaks down, especially in crises? My exploration of heterogeneity in biology and biomedicine took off after I saw the overlooked significance of underlying heterogeneity in heritability studies. Most of the cases in the talk, however, revolved around a simpler form of heterogeneity, namely, variation around a mean. Should I—for expository and/or conceptual reasons—focus separately on the different kinds of heterogeneity. I have an evolving taxonomy of heterogeneities, http://sicw.wikispaces.umb.edu/heterogeneities. The figure I used to discuss the issue of misclassification lacked a crucial element—a cut off point between OK and not OK medical outcomes. 4. Isn’t simplification of complexity sometimes/often/always necessary for scientific progress? After researchers get a handle on the simplified situation, they add back variables that they had previous controlled. Sometimes researchers add back variables; sometimes they continue to engineer the world so the control over those variables is maintained. They may come to see the world the same way as they control it and need ways to be reminded early and often of what has been left out. This is especially so regarding ecological complexity, where variables left out have dynamics of their own that interact with the variables in focus. 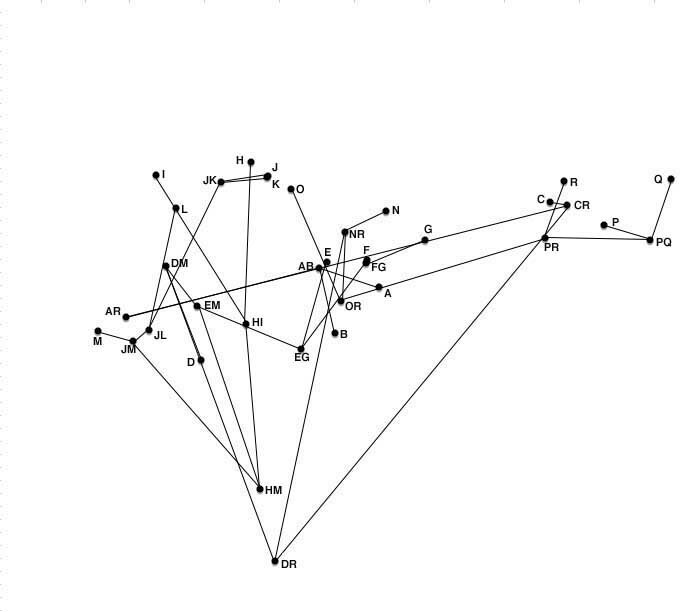 Chapter 1B of my book, Unruly Complexity (U. Chicago Press, 2005), illustrates the problem of “apparent interactions” that arise. Indeed, I have come to see the “simplification is necessary for science” line as a way to define out of science many situations that deserve systematic study. What do philosophers and theoreticians think about getting to know situations that, from the start, are not amenable to control or are not the same thing if they are carved out from the whole? Fresh perspectives can be brought to modern understandings of heredity and life-course development by examining the relationship between control and variation, particularity, or, more generally, heterogeneity. Broadly speaking, my contention is that research and application of resulting knowledge are untroubled by heterogeneity to the extent that populations are well controlled. Such control can only be established and maintained with considerable effort or social infrastructure, which invites attention to possibilities for participation instead of control of human subjects. Building on several recent publications of mine on heterogeneity and heritability, I explain why underlying heterogeneity warrants the attention of quantitative geneticists and critical commentators on nature-nurture debates (see post). I elaborate on my contention through brief sketches of cases from biomedicine, involving: genetic testing; gene-environment interaction; personalized medicine; IQ scores; racial-group membership; and life events and difficulties research. My goal is to stimulate wider exploration of heterogeneity and control in relation to biological and social theories and practice. 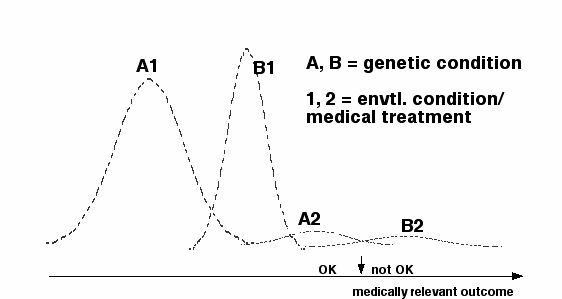 This entry was posted in biomedicine, Sci&TechStudies(STS) and tagged apparent_interactions, complexity, heritability, heterogeneity, personalized_medicine, variation on October 19, 2010 by Peter J. Taylor.